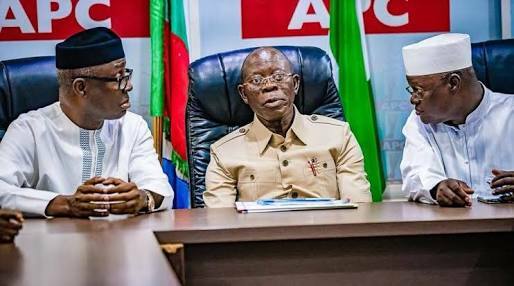 The National Chairman of the All Progressives Congress, Adams Oshiomhole, has alleged that some politicians within the party may be working with the opposition Peoples Democratic Party to publish lies against him in a bid to tarnish his image. He said he had become a target of attack because he resisted criminal overtures from politicians who wanted to bend the rules during the recent primaries of the APC. Oshiomhole stated this in a statement by his Chief Press Secretary, Simon Ebegbulem, while reacting to allegations that he received $50m from some aspirants to get the favour of the National Working Committee. He urged the media to demand evidence from politicians before helping them to spread the lies allegedly hatched by the PDP to tarnish his image and those of notable chieftains of the party. The statement partly read, “We are aware that part of the strategies discussed in Dubai, where the PDP leaders recently visited and held their meeting, was to continue to dish out lies against top APC leaders with a view to distract the leadership of the APC ahead the 2019 general elections. “But they have failed because the national chairman and APC leaders are focused and will never be distracted. It is sad that instead of commending the National Chairman for resisting criminal overtures to compromise him, he is being relentlessly harangued, abused and accused of receiving phantom bribes. “However, it is time these irresponsible lies stopped; otherwise, anybody who continues to make unsubstantiated allegations against the person and character of the national chairman should be ready to provide proofs in a court of law.